More than 200 people from four states have been infected with a parasite called Cyclospora cayetanensis after eating pre-packaged Del Monte Fresh Produce vegetable trays containing broccoli, cauliflower, carrots, and dill dip, according to the FDA and the Centers for Disease Control and Prevention. Cyclospora can cause an intestinal illness called cyclosporiasis when it contaminates food or water and is then ingested. Symptoms include frequent diarrhea, loss of appetite, weight loss, stomach pain or cramps, bloating, increased gas, nausea, and fatigue. If not treated, these symptoms may last up to a month or longer. Health officials have reported 212 cases linked with recalled Del Monte 6 oz. and 12 oz. vegetable trays in Iowa, Indiana, Minnesota, and Michigan. Seven people had to be hospitalized. 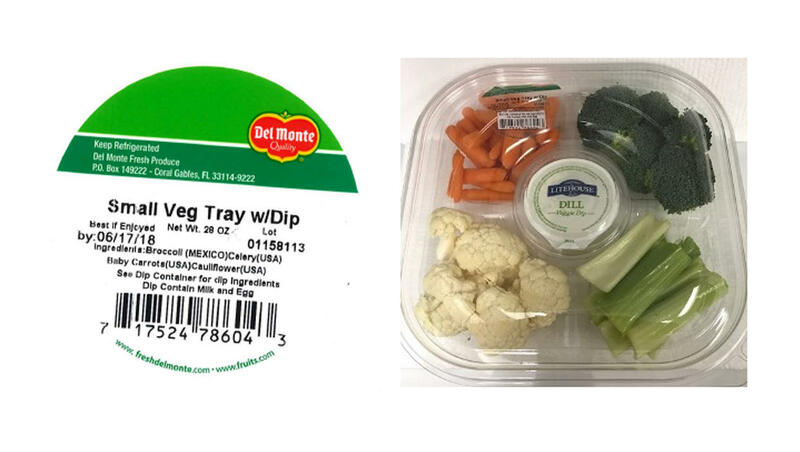 The company is also recalling these veggie trays in the state of Wisconsin, as well as 28 oz. veggie trays which include broccoli, cauliflower, carrots, celery and dill dip, which were distributed to Illinois and Indiana. The recalled products were distributed to the following stores: Kwik Trip, Kwik Star, Demond's, Sentry, Potash, Meehan's, Country Market, FoodMax Supermarket, and Peapod. Consumers who have purchased the recalled items should not consume them and throw them away immediately. Officials say people who have already eaten these products and have had diarrhea lasting more than three days should contact their health care provider.